This listing at 1238 Skyhaven Rd, SE sold in only seconds after being listed! This home was purchased for $142,000 in July of this year. After a few updates, paint, and landscaping it sold only hours after being listed. 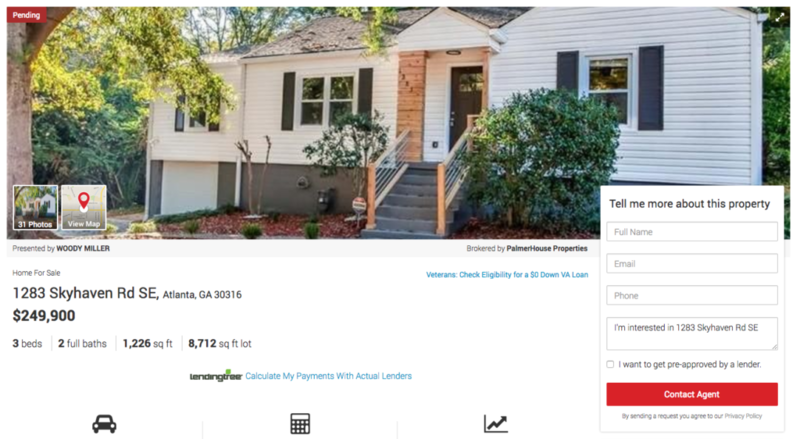 (Read Full Article from Curbed Atlanta) So what makes a great selling home in Atlanta? This 1950’s home is not exceptionally spacious, it’s only a little over 1,200 sq ft. It is not particularly close to shops for easy walking either. So what made this one special? This house is priced right, in an up-and-coming area, and is just right for a young family or first-time home buyer. Keep in mind who will be buying the home. This one is styled in a simple, yet modern, way. There are several hip trends, like a barnwood accent wall, stainless appliances and not a speck of beige in sight. It is clear who this house was styled for. When you get ready to list, think about the buyer. This listing was a flip, but simple changes can give your home big appeal! Keep scale in mind, don’t overfill your space! Walking through the home should be easy for potential buyers. Most likely due to the size of this home, the seller used only a few pictures on the wall. What must be small bedrooms would feel more open without a bed and storage furniture. If you are living in your home during the selling process, consider getting a storage unit for oversize furniture or extra storage. Light, open, and clean sells homes! These are features every buyer looks for and this listing has it. Remove heavy drapes to let in more light from windows. Still dark? Try adding accent mirrors or painting the walls a lighter color. A clear line of sight in rooms makes them feel larger. Remove obstacles that break up the view. If your home is closed concept (versus open), clear out unnecessary furniture so that the room has as much free floor space as possible. Finally, make sure it is clean! A fresh coat of paint can go a long way; scratches and discoloration makes a home look dirty. A clean home means a well cared for home and buyers love it! For more information about this home and it’s features read the full article.